My kind of comfort food! I just love everything legumes. 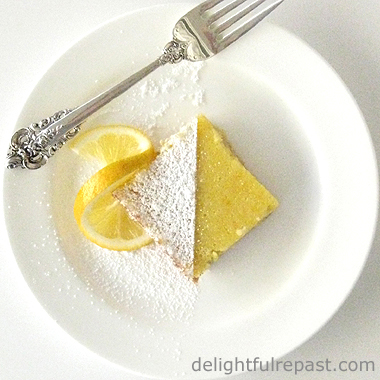 Thanks, Jean, for sharing this simple yet terrific recipe. Thank you, Angie. We'd starve to death without our legumes, wouldn't we?! YUmmmm, I have some tortillas just crying out for refried beans today! Thanks, Mrs Shoes. Soooo much better than anything out of a can! Pinto Beans are a staple here at the cottage, we have them at least once a week. Your recipe is great! Thanks so much for sharing with us at Full Plate Thursday and you have a great weekend! Thanks, Miz Helen! Love the beans with cornbread, too. One of the great anthropological/archaeological losses of modern times occurred when I could not locate my dear departed mother’s been recipes. A mixture of experimentation and imagination on the part of moi was – alas – only partly successful. True, it was inedible; however, I was able to run my car for almost a year on one tank of the result. Beans are a staple. Pip, pip for your sharing of methodologies. I do like mucho pork involved, and I’ve been known to go through a box of brown sugar in the process. It’s amazing how good just plain old catchup tastes on the end product accompanied by butter embalmed in hot soft rolls (how sad that you are allergic to garlic, as garlic toast is another perfect add-on). Sully, glad to be reminded that you are a bean fan. Of course, the Baked Beans - http://www.delightfulrepast.com/2012/02/baked-beans-from-scratch.html - have all those extra ingredients you love. I could live on bean burritos. Martha, thank you. Yes, the home-cooked beans of any variety are always better than the canned version. And with a slow cooker, it's no more trouble than opening a can! Not really big on beans but you might give me motivation to give them a try! Jeanie, my husband is not a bean fan either. But I think he, and possibly you, simply didn't have enough exposure to them in childhood. You should give them a try! Hi Jean!I am always learning about food in your blog...I've never heard about that recipe,it looks good!Since I was a child,we usually eat black beans everyday,very common here...Hugs. In the immortal words of Rihanna, "Where have you bean, all my life???" Hi, Maristella! How interesting about the different kinds of beans that are popular in different countries. I never thought of black beans as being common in yours! I like black beans, too, especially in a spicy soup. Margie, I'm so out of it, I've never heard that song! I barely know who Rihanna is! :D But I always appreciate a clever play on words. Come back next Thursday for tea! I haven't had refried beans for many years and your post reminded of my friend who used to make them. Thanks for sharing your recipe with us at #BloggersPitStop. Have a great week! Yum, looks tasty and I know it surely is. Sounds like my kind of food :) Thank you Jean for attending the #WednesdayAIMLinkParty. I pinned your post on Pinterest and shared it on Facebook, Google+, and Twitter. Thank you, Sue! Last night I used some of the whole beans to make bean quesadillas. They were really good. Thanks, Grammy Dee! And your social media shares are much appreciated! 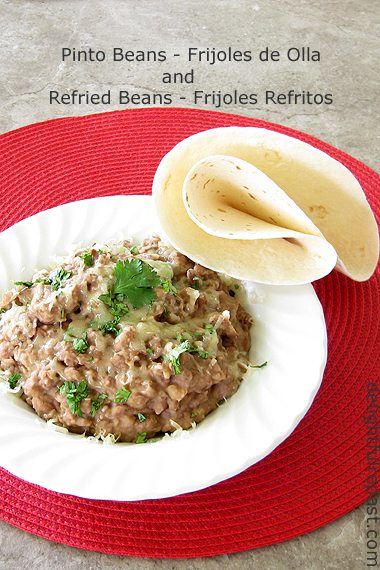 We love refried beans and I greatly appreciate the recipe! Happy Weekend. Thanks, Mildred. It was funny, the cat was meowing around the kitchen as the beans were cooking - it seems he would like beans! I didn't know you're allergic to garlic - what a good thing it isn't needed for most of your baking recipes! I confess I have never cooked my own beans, except for one time where I received a mason jar of soup ingredients as a gift. But you're right, the math is undeniable. And I do love your slow cooker technique. Thanks, Jean! Thanks, Pauline. And I like the way you put that - the math is undeniable! Abigail, my youngest has been doing her GCSEs this Summer. They are the exams 16 year olds take here in Britain. Every 16 year old has to do an exam in every subject as well as a few chosen extras. Abigail did 11 different subjects this Summer. I shall get to the point now. She did her Spanish GCSE. That included an aural exam where she spoke for five minutes on a given subject in Spanish and then answered verbal questions in Spanish. She then had to do another exam which included a dictation and had to write about a choice of subjects in Spanish. Marilyn and I heard Spanish spoken in our house for weeks!!! Abigail's accent was spot on too!!! Ha! Ha! Your Spanish is not bad by the looks of it Jean. Anyway, apart from that, the giveaway. That electrical plug socket is NOT European and definitely not British. I wonder where in the world you are Jean? Ha! Ha! Frijoles de olla are the tradition here in Tucson, but occasionally you can find good refried beans. The nice thing here is that no one puts garlic in their beans. Such a relief for you and me! I have never made my own refried beans... maybe I should try! Tony, what fun! Abigail sounds delightful. My Spanish-speaking ability has gone waaaaay downhill since I was her age - I couldn't come close to passing Spanish GCSE. But as long as I can read a menu - that's the most important thing in any language! That IS nice, David! Lots of people I know put garlic in everything. And canned beans usually have garlic (garlic powder) in them - not good. I hope you'll try these refried beans soon. You make delicious food I love that you serve it as portion. I am in for some digging. Thank you, Swathi. I love to cook large batches of stuff and portion it out to freeze for future meals. Dawn, thanks so much (and thanks for the tweet!). I hope you'll try it soon and let me know how it turns out for you. Mmmm...I do like me some re-fried beans as a side with my Mexican dishes but have never attempted to make my own...other than opening a can and heating them up! Really looks delish! Thanks for the comment you left over on my blog and thanks for the yummy recipes! Have a great week! Debby, thank you! 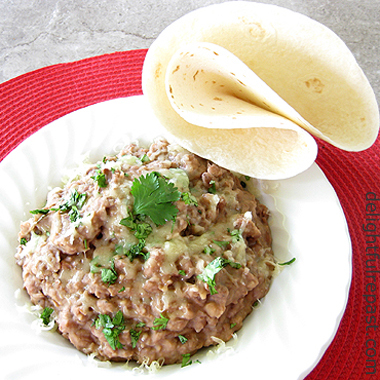 Let me tell you, if you like canned refried beans, you are going to LOVE homemade! Jean, you have perfect timing with this post! I have been wanting to make more beans from scratch instead of using them from tins! Love that you made these in the slow cooker, and also love the tip about the hot water. 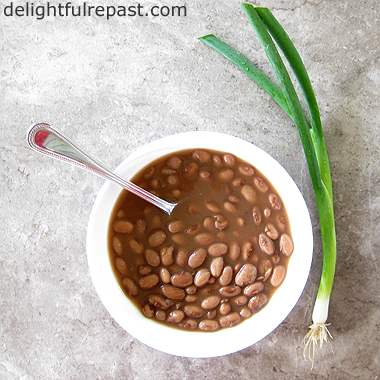 It's nice to have a refried bean recipe too as they are a favourite of mine - although I have to make them in small batches as my hubby isn't so keen. More for me though ;-) Thank you so much for sharing, and for being a part of Hearth and Soul. Scheduled to share on Pinterest and Twitter. Hope to see you at the party again this week! I love your tip on using the crock pot. I know a lot of people think the crockpot is 'outdated' but there are certain things that just taste better when slow cooked and it looks like you found another. I love cooking and freezing my own beans because we try to avoid salt and the canned ones (even low sodium) are so high in sodium. Thanks for the recipes -- I LOVE refried beans! Thank you, Lauren. I don't use my slow cooker nearly often enough, but I do think of it more during hot weather! My cooking "big" and freezing meals really saves me in summer. Oh yum, my kind of comfort food. Thanks for sharing the recipes and methods! Thanks so much, Ellen! 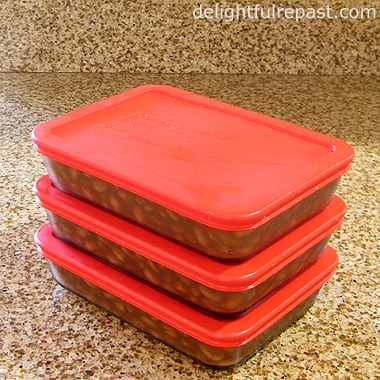 I have lots of bean lunches because my husband isn't a fan! Wow that looks good, and certainly easy enough. Thanks for the translation tip. I love stuff like that. And I'm very sorry that you're allergic to garlic. Judy, thanks! And thanks for the sympathy - it's a tough allergy to deal with when others are doing the cooking. Thanks, Greg. It's a breakfast that suits me just fine! 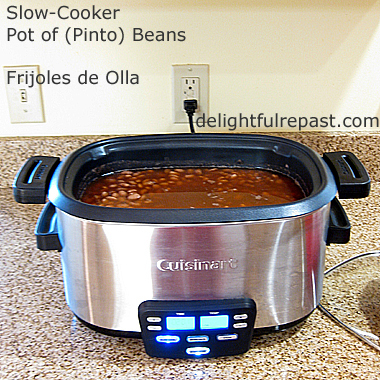 I've been cooking pinto's in my pressure cooker for years and love them! I can't stand caned beans. But I have yet to actually make refried beans. Looks super easy and tasty! And a great alternative to just eating a full pot of whole beans. Thank you, Richard. I've used canned pinto beans in a pinch, but they take lots of "doctoring" and time to get the taste of the tin out of them! And the liquid in the can is awful, needs to be drained away - so none of the good bean broth you get with cooking your own. Yummy! I love, love, love, homemade refried beans! (I even have an old blog post with my recipe.) They are such a comfort food, for me. Not only do they taste great, they are also, a very cheap meal or meal stretcher. :) Your beans look delicious! Thanks, Sister in the Mid-west. My husband won't eat them (he doesn't like "mushy foods"), but I think they're wonderful!